Jericho, a city of high antiquity, was situated in a plain traversed by the Jordan and was exactly over against where that river was crossed by the Israelites under Joshua. It was five miles west of the Jordan and seven miles northwest of the Dead Sea. It was rulled by a king, and its walls were so considerable that houses were built upon them. The spoil that was found in it reflected its affluence. Jericho is first mentioned as the city to which the two spies were sent by Joshua from Shittim. 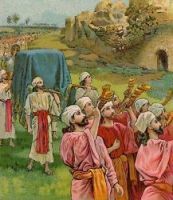 These assorted illustrations of Jericho are taken from several Bible books. Feel free to use these drawings of Jericho in your artistic creations. Click on the Jericho pictures below to see more details about saving a free Jericho image or about purchasing an image of Jericho at a higher resolution.